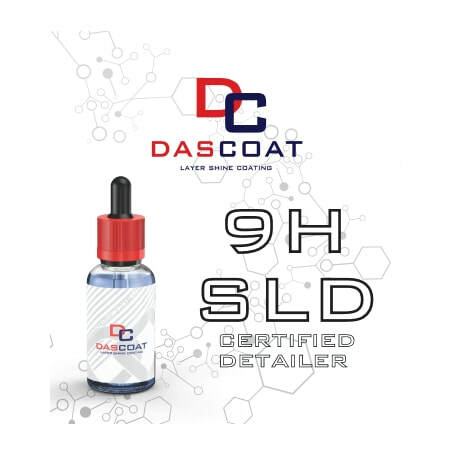 DASCOAT 9H SLD Ceramic Coating treatment represents the ultimate level in terms of ceramic treatment due to its exceptional protection and durability. Its hardness is also exemplary by adding 9H + to the MOHS scale. Thus, the resistance to micro-scratches is significantly increased especially during the drying phases of the vehicle after washing. We recommend applying DASCOAT 9H SLD on a new or polished body to ensure maximum durability and bonding. Guarantee is given for 5 years or 50,000 miles. 9H SLD can only be applied by a certified Detailer. Small Cars £545 - Citroen C1, Smart Car, Audi A1, Toyota Aygo, Ford KA, Toyota QI, Fiat 500, Vauxhall Corsa, Ford Fiesta, Renualt Clio. Medium Cars £560 - Audi A3, BMW 1 Series, BMW 3 Series, Mercedes C Class, VW Golf, Peugeot 307, Ford Focus, Vauxhall Astra. Large Cars / Small SUV £575 - Audi A4, Audi A6, BMW 5 Series, Mercedes E Class VW Passat, Porsche Macan, Range Rover Evoque, Peugeot 508. Extra Large SUV / 4x4 & Prestige - £590 Audi Q7, BMW X5 / X6, Porsche Cayenne, Range Rover Vogue, Mercedes ML, Ferrari, Porsche, Aston Martin, Lamborghini. ​Small Cars £600 - Citroen C1, Smart Car, Audi A1, Toyota Aygo, Ford KA, Toyota QI, Fiat 500, Vauxhall Corsa, Ford Fiesta, Renualt Clio. Medium Cars £630 - Audi A3, BMW 1 Series, BMW 3 Series, Mercedes C Class, VW Golf, Peugeot 307, Ford Focus, Vauxhall Astra. Large Cars / Small SUV £660 - Audi A4, Audi A6, BMW 5 Series, Mercedes E Class VW Passat, Porsche Macan, Range Rover Evoque, Peugeot 508. Extra Large SUV / 4x4 & Prestige - £690 Audi Q7, BMW X5 / X6, Porsche Cayenne, Range Rover Vogue, Mercedes ML, Ferrari, Porsche, Aston Martin, Lamborghini.